Here's hoping Qualcomm ships its flagship smartphone processor soon. Qualcomm has been talking up the Snapdragon 820 as the chip for next-generation smartphones for most of 2015—but that hasn’t stopped the company from announcing a derivative aimed at cars. At its CES press conference on Tuesday, Qualcomm chief executive Steve Mollenkopf said that the Snapdragon 820 was being designed into 80 new devices. 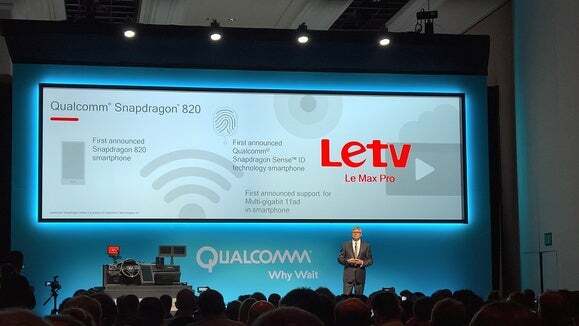 Unfortunately, we’ve barely seen a single one—although Mollenkopf revealed that Chinese manufacturer Le TV’s Le Max Pro phone would include it. One of first public customers to use the Snapdragon 820 is Chinese hardware maker LeTV. But any design delays associated with the 820 haven’t stopped Qualcomm from designing a derivative chip for cars: the Snapdragon 820Am. In a sophisticated demonstration that encompassed navigation, automated driver assistance, and even distracted driving, Qualcomm executives showed off a system of four 4K displays scattered about a car’s interior, complete with smartphones, processing the information in real time. The setup even included internal cameras that tracked a driver’s head positioning and made a determination on whether or not they were paying attention to the road. The system assumed that up to 600 megabits per second of data were being passed back and forth between the cloud and the car. “This is what is possible with connected compute technologies,” Mollenkopf said. One of Qualcomm’s stauncher partners appears to be Audi, which said that it will use last year’s Qualcomm Snapdragon 602A chip inside of its A5 models before the end of the year, and in its A4 and Q5 models in 2016. Audi, which is known for its large, attractive in-dash displays, will be able to use the chip to double the available computational horsepower driving them, according to Ricky Hudi, Audi’s executive vice president of electronic development. Qualcomm will also release a series of upgradable modules that automakers can include in their designs, Mollenkopf said. Meanwhile, Qualcomm has also made inroads into the Internet of Things. Qualcomm announced a series of chips for smart cities, including the 9607 LTE chip that’s designed to run for ten years on a pair of AA batteries, and the CSR102X Bluetooth SOC, which can stream HD audio to a pair of headphones. 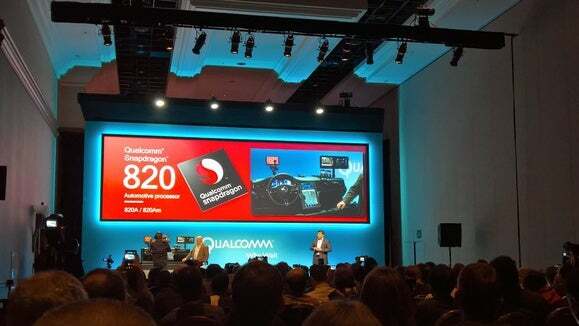 Qualcomm already powers more than 65 wearables, Mollenkopf said, with 50 new designs due in the first quarter.